One of our favorite aspects of running Nodus is designing new models. Each one starts with a general overarching concept, and slowly progresses through countless iterations and liaising between engineers, suppliers, and us, the designers. For the Avalon, we started with the goal of creating a professional cushion-case diver, but as it is with all our designs, we needed it to have enough versatility to be suitable in everyday situations. Cushion-cases have a rather divisive design aesthetic. They were historically retro-inspired and had very “tooly” characteristics, which to some may be a turn-off. The more we unwrapped the designs of watches like the Eterna Kontiki and the Seiko Turtle, the more we realized how hard it is to give these watches a certain “wearability” that can cross the chasm between boardwalk and boardroom. Legibility in all lighting conditions is important. Folding the hands allows them to catch light at different angles. One of the standout features of the Avalon is its legibility. In addition to scorching lume application, the shape and size of the hands and indices are designed to be easily legible in all lighting conditions and allow for bright lume application. The initial prototypes we made had a date window at six o’clock, but we opted to do away with it to stay true to the concept that we set out with; to create a no-frills diver with minimal distraction on the dial. Now that the Avalon is out in the world as we intended, we may decide to add a date feature at some point in the future. The sand-blasted knurled texture combined with the hour notches maximizes the grip. The lume application is perfectly flush with the ceramic insert. One of the most important aspects of a dive watch is its bezel. A fully-lumed matte ceramic bezel matches the matte dial, giving it a utilitarian flare to balance out the subtler wearability, but it also comes with the option of a stainless steel bezel for a little bit more of a rugged flavor. Not only is visibility important, but it should also be easy to grip and rotate. The initial prototypes of the Avalon had the notches on the bezel at every hour, but we felt that it could use a little bit extra grippage, so we added knurling to the surfaces between the notches. To add a bit more friction to the bezel, the grip features a two step design, which adds to the functionality without adding any extra surface. It was pivotal, not only for the functionality of the bezel, but also to maintain the sleek downward slope of the bezel. Finally, to put the cherry on the cake, the entire grip was bead blasted to add one more dimension of functionality, while the top is polished to add some aesthetic contrast and to shrink the apparent “wearability”. The ceramic inserts proved to be a point of difficulty as well. We found that in most watches that used ceramic inserts, especially in the under $2k segment, the ceramic inserts had issues that swayed us from using it. We briefly discussed this in a previous blog post discussing why we chose to use sapphire over ceramic on our first model, the Trieste. Some of the pervasive issues that we found were uneven/bumpy lume application, discoloration of lume, and uneven finishing on the ceramic. Occasionally, we also saw lumed ceramic in the $4-6k segment that had issues with lume chipping off. We learned that the the reason for all these issues was not a matter of manufacturing capabilities but rather, order of operations. The standard we held ourselves to in manufacturing the Avalon’s bezel insert was the Tudor Pelagos. First, the inserts are shaped to our specifications, before being engraved. Once the engraving is complete, lume is slightly overfilled then shaved down. The shaving process leaves light scuffing around the lume plots, so we leave the sandblasting until after the lume is shaved down. Once the matte finish is achieved via sandblasting, a light protective film is applied over the lume, which gives it a more glossy appearance, in contrast to the matte finish of the ceramic itself, and adds an extra layer of protection against discoloration and chipping. One of the things we focused on for the Avalon was the bracelet. We were not about to release a watch that we worked so hard on for two years with a bracelet that was merely “good enough”. We experimented with different degrees of lateral flexion and settled on a good balance that we felt was comfortable but not flimsy. 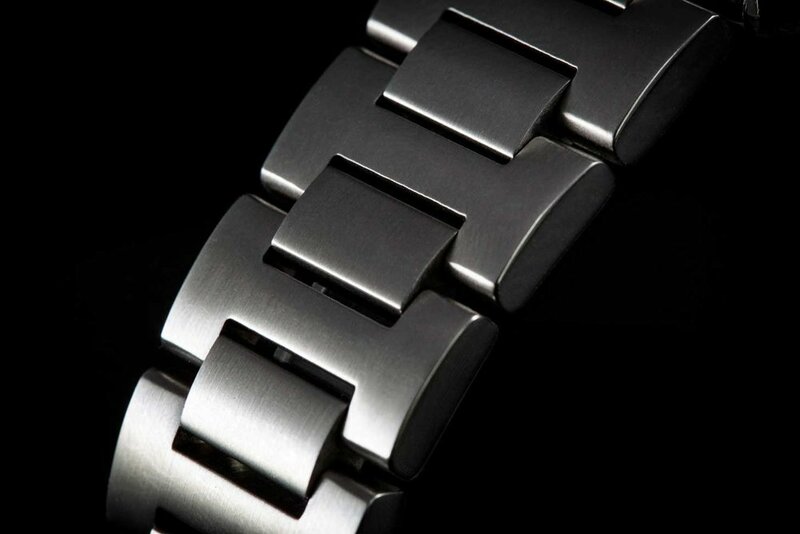 The finishing on the bracelet links is one area that we found many manufacturers overlooked. There is a certain feel that well-finished bracelets have that can only be conveyed by handling one in person. The standard we held ourselves to was the Seiko SBDX001, also known as the Marinemaster 300. The edges of the bracelet were polished down to have a softer feel and the surfaces between the links were fully brushed to give the bracelet a refined look and feel. The Nodus H-link bracelet is comfortable but not dainty. We kept a 20mm lug-width despite the 43.5mm case diameter, and in many ways, this goes against conventional watch design. When we first made the decision, we saw mild pushback from people, some of them stating that the golden rule is to take the diameter and divide it by two, rounding up to either 20mm or 22mm if we land on an odd number. However, when we entered production, the proportions felt better keeping the lug width at 20mm, as it helped the watch wear smaller and more comfortably. At 22mm, it made the watch look and feel significantly heftier. Additionally, it was important that the screw pins were manufactured with tight tolerances to provide ease of use and to prevent stripping. The flaring case sides allows for maximum mobility and comfort. 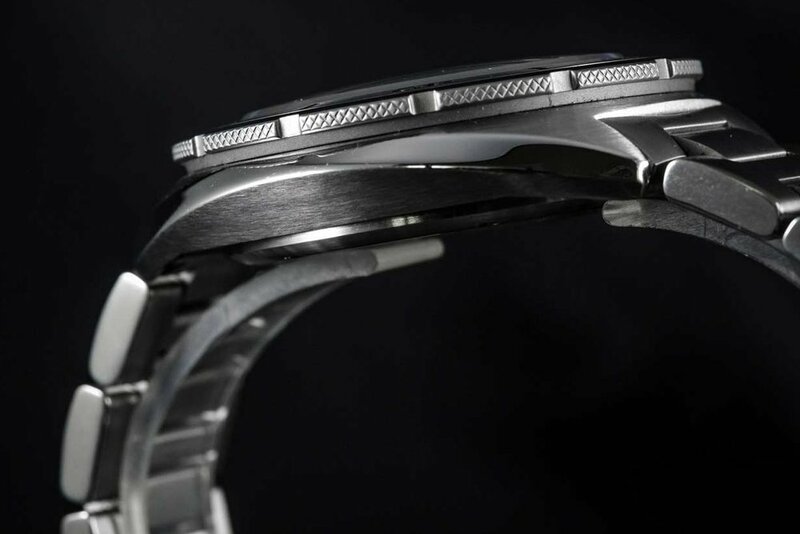 The Avalon’s case is the defining feature of the watch. Affectionately nicknamed by early owners as the “Nurtle,” or “Tordus,” it is no secret that the Avalon was heavily inspired by Seiko case design. While we didn’t pull any design features from a specific reference, we loved how Seikos wore on the wrist and wanted to channel the same wearabilty in the Avalon. By keeping the Avalon thin, it slides perfectly under the cuff, but with its larger diameter, maintains its practical aesthetic and functionality. The sides of the case were designed to flare up to follow the contours of your wrist for maximum comfort and mobility. However, achieving the sharp angles was not an easy feat for us due to the higher cost and longer process of fully CNC machined cases. We vetted multiple factories and found that the majority of them did not have the supply chain capabilities to create the case we designed. I was told by an OEM based in Hong Kong that out of 100 factories, only one might have the CNC machinery and expertise required to create the Avalon. Unlike most watch cases, especially ones that have straight sides, the Avalon requires CNC machining from the very beginning as opposed to the more standard method of cold-formed steel. Think of CNC as a sculpture carved from a solid block of ice or stone whereas cold-formed steel is more akin to pressing a steel cylinder through multiple presses. CNC is typically used to create chamfers on cold-formed steel cases, but as a professional dive watch, we needed the CNC tolerances from the beginning of the steel cutting process to ensure dimensional stability and water resistance. The case was designed to withstand hard knocks and take a serious beating, but also “melt” into the wrist for maximum comfort. The contours of the case follows the contours of the wrist, and in combination with the crown placement at four o’clock maximizes mobility and comfort. Because of the dramatic curves and bevels, it enables us to push the sizing of the watch beyond what we (and most watch enthusiasts) are typically comfortable with without sacrificing wearability. Those who know us would know that from the very beginning of Nodus, our main priority in terms of quality was the case finishing. It is something that is easily overlooked because of how difficult it is to decipher. The difference between a grade A and a grade B could be non-existent, or it could be vast. When it comes to case finishing, there are two brands that we look to to set the standard depending on the finishing method in question; Seiko for their polishing and Omega for their brushing. In our opinion, no other watch brand has been able to come close to their standards. A couple of years ago, I acquired an Omega Planet Ocean, and the first thing that I noticed was that the brushing had a shimmer to it that no other watch I have seen up until that point had had. 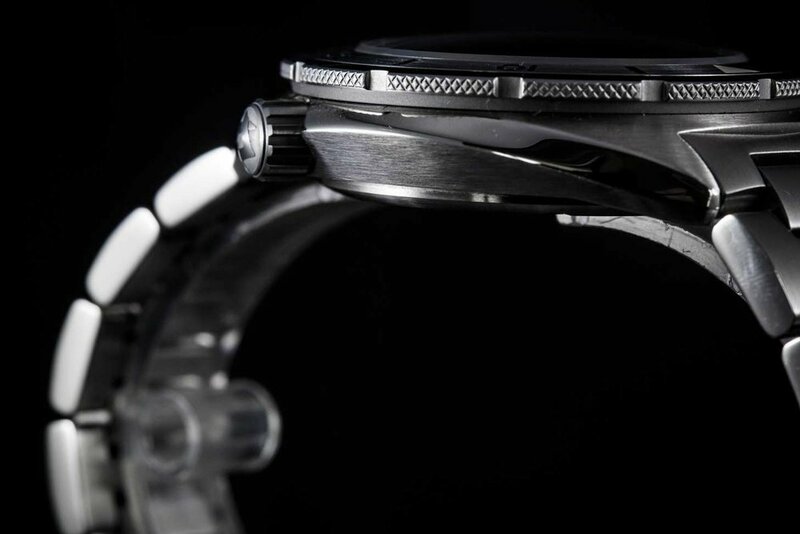 Since then, I’ve asked people in the industry, from fellow brand owners, to engineers, to watch manufacturers whether they knew anything about how Omega achieved this texture. We experimented with different case shapes and brushing techniques. While many of them had noticed the same thing, none of them knew how Omega achieved the shimmery brushing texture. The special brushing technique that Omega catches the light in a unique way. The Avalon case brushing has a similar effect, achieved by months of trial and error. I had my suspicions that they used a multistep process, starting with a coarse grit then working towards a finer grit brush wheel but because of the difficulty in manufacturing the case, we initially thought that maybe we would focus on this on the next model. Ultimately, we figured that since we came this far and worked this hard, we should go all the way. We knew we were able to achieve the sharp transitions because of the tight CNC tolerances, but we wanted to go achieve that Omega style brushing that I had been obsessing over for years. After months of iterating and experimenting with different case shapes and brushing styles, we finally nailed it. The Avalon was the longest project we’ve had at Nodus, because it was incredibly complex compared to many of our previous designs. While many of the details may be easily overlooked, it was a watch that deserved to be perfect. The added costs and time commitment was a tough pill for us to swallow but we knew that one day when we looked back at the Avalon, we wanted to be proud, but more than that, we wanted our customers to be proud to wear it. In a way, releasing the Avalon felt like a huge weight has been lifted off our shoulders, but in reality, I think it set a new standard for our brand. Like many of the brands that have inspired us, we strive for perfection and the only way to achieve perfection is to get involved at every step of the process, from the design to the manufacturing to the assembly. And while the Avalon has been our most involved design to date, it set the foundation for Nodus to create more innovative designs and push the envelope. Now, back to the drawing board.